International Journal of Research in Health Sciences,2014,2,3,729-733. 1,2,3&4Department of Microbiology, NMC, Raichur, Karnataka, India. 1Associate Professor, 5Professor, Department of Biochemistry, NMC, Raichur, Karnataka, INDIA. Background: Misuse of antibiotics in the treatment of infections leads to nosocomial infection as well as community infections. The objective of the study was to know the aerobic bacteriological profile of clinical specimen and antimicrobial sensitivity pattern of bacteria isolated from various clinical specimens which provides a basic profile of bacteria and their sesitivity pattern. Materials and Methods: Study design included 200 samples which were processed (excluding blood samples) they were pus, urine, sputum throat swab, stool etc. All the isolates were identified by their colony morphology on nutrient agar, macconkey agar and blood agar. The organism was identified by direct gram stain, gram stain. It was phenotypically identified by conventional biotyping. Antimicrobial sensitivity pattern was done by disc diffusion method according to CLSI guidelines. Results: 200 samples that were cultured from various departmental OPD’s of which 95(47.5%) were positive for culture. The samples that were processed were Pus (90 no), Urine (19 no), sputum (43 no), throat swab (24 no), stool (13 no), gastric aspirate (11 no). Age group 1 to 10 yrs (40 no) followed by 21-30 yrs(41 no), preponderance is in females than males. 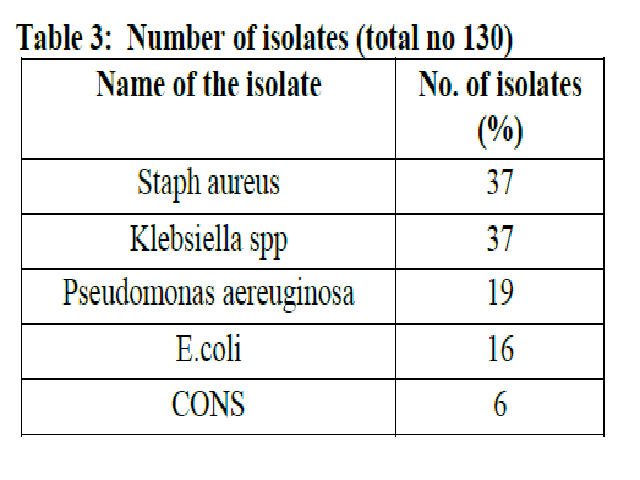 Commom organisms isolated are Staph aureus & Klebsiella spp. Antibiotic sensitivity pattern was processed by CLSI guidelines among gram positive organism (staph aureus) showed sensitivity to vancomycin 48%, CO (41%) Tetracycline (22%) followed by Klebsiella spp (GNB 37 no), I (13.5%), Gatf (8%) CP (8%) CFS (5.-5 %) AL (5.5%) followed by Pseudomonas aeruginosa (19n): I- 53% sensitivity to CAZ 42% G (31.6%) Tob cb, gat (10.5%) followed by CONS – (6 no)- AMC (16.6%) CP 33% Va- 33% followed by Streptocococcus pyogenes (4no), Bacitracin (50%), Va (25%) & CP – (25%). Conclusion: This study gives us the baseline data for prescription for the patients, more research is needed to find association of culture and sensitivity reports with the antibiotics used in the hospital and the practical utility of such data for the hospital and even other hospitals in the community. Gram positive organism are more sensitive to Vancomycin & GNO to Impenem.